As you may know since 2012 a group of like-minded individuals called The Exiles have published an annual literary journal called The Lost Country. Each year the journal has grown, receiving higher quality submissions and increasing its circulation each issue. We are writing today to ask you to support our upcoming Fall 2016 issue. The first issue was published in 2012. We are proud to be celebrating our 5th year and our 6th issue. This year we are increasing our prizes from $50 to $200! Last year we received over 500 submissions from over 300 writers. Our writers hail from all over the world. We have received submissions from: Australia, France, Germany, Israel, Italy, New Zealand, Norway, Canada, England, Scotland, & others. You may not know this, but when an author submits his or her work to a literary journal they are often charged a “reading fee.” These fees are often in excess of $15 per submission. At The Lost Country we are proud that our submissions have always been free and open to everyone. We want to encourage our writers to submit their best work without the added worry of a prohibitive reading fee. We shudder to think about how many great works we might have missed out on simply because someone didn’t have the funds to pay for us to read their work. In addition to having free and open submissions, it is our long-term goal to pay every author for each work that we publish. And that is why we are asking for your support! If we can raise enough money through donations and issue pre-sales through this campaign, we intend to compensate every author we publish in this years issue with $50 per work. Last year, we published 32 poems, 5 short stories, 1 essay, and a book review. And we intend to publish even more this year! That means in order to have the funds to pay each of our published authors we need to raise almost $3,000. With your help we know we can! Donations of any amount are appreciated! You will receive a personal letter thanking you for your donation. In addition, your name will appear on the supporters page of both the online and the print issue of our next issue. 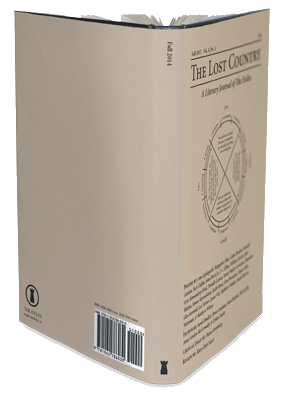 In addition, you will receive a signed early-copy of The Lost Country, and a special The Lost Country lapel pin. In addition, to the above, you will be invited to a special Issue release party (in Fort Worth). Dinner and drinks will be provided. Speaker to be announced. You won’t want to miss this!